Feist is brutal. When you’re not leaping over spikes, jumping between tree branches or scurrying through dusty cave networks, you’re bludgeoning furry creatures to death with rocks. That’s not even the most brutal thing about Feist. The most brutal thing about Feist is how desperate its encounters are: they’re protracted, stressful, improvised fights to the death. Feist is remarkably tense for a platformer. As a furry sentient ball in a dangerous forest, your sole task in Feist is to survive. Staying alive is simple enough at first because in early levels enemies are easily evaded. If you must kill, there are usually weapons—sticks, rocks, pinecones—within reach. It’s when enemies come thick and fast, and when useful objects are few and far between, that things get uncomfortable. The minimal silhouetted art style may recall Limbo, but anything resembling a puzzle in Feist is rare. Instead, the misty woods throw up increasingly fraught survival scenarios, most of which are won with either the benefit of hindsight (i.e. many preliminary deaths) or lightning quick thinking. Unlike most platformers, Feist’s enemies don’t march blindly forward or follow preset paths, but instead react to the player. Minor enemies like bees, caterpillars, and spiders will gang up before you can mutter “dang”, while larger mole-like creatures will hunt you to your death. Bees can be grabbed and used as makeshift spear launchers, but most of the time the aforementioned sticks and stones are the only weaponry at hand—and moles can use them, too. To make matters more complex, traps and other interactive environmental structures can be triggered by enemies, and most of the combat resources can be destroyed too. This results in combat encounters that feel like real-life brawls: graceless, messy, and staggeringly violent. 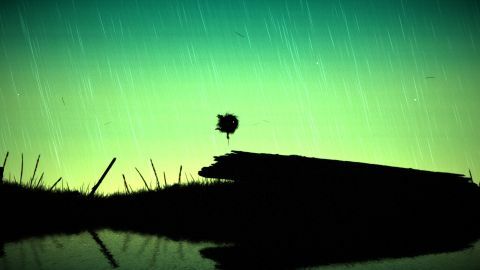 For a sidescrolling game with a minimal artstyle, Feist’s violence is unusually affecting. The odds are rarely in the player’s favour. I never felt like I’d mastered Feist, and I never felt like I could invest faith in the skills I had learned. The world’s tension is heightened by the music: a quiet, forlorn ambience shrouding the woods of Feist in a supernatural melancholy. The art style is simple yet naturalistic, albeit a little monotonous. There are moments of startling beauty in Feist, but never of revelation or surprise. The game’s core strength is in problem solving under immense pressure. Feist sometimes breaks its own rules, though. At one point I spent ages attempting to solve a problem without slaughtering yet another giant mole, only to find that killing it was the only way to trigger a nearby trap, thus allowing progress. In a game driven by improvisation, Feist occasionally blocks progress for obscure or illogical reasons. Either that, or the chance interplay between enemies and interactive environmental elements creates unsolvable scenarios. That’s no fatal problem as checkpointing is generous, but it still grates. That's me on the left, wielding a live bee against its friends. Meanwhile, the animation and movement is fluid and readable, but I had difficulty triggering certain actions reliably. Grabbing bees felt like trial and error, a frustration compounded by the high difficulty of pretty much every encounter. These gripes aside, the raw components of Feist work: the platforming is precise and predictable, and the physics are consistent, the latter very important in a title that prizes emergent gameplay. Feist is definitely a challenging game, but it needs to be. At a time when the word ‘survival’ is bandied about frequently in relation to PC games, Feist offers a stranger, much rawer take on the concept. Bits and Beasts has struck a delicate balance between systems-driven battles and environment-driven storytelling, but they’ve also made one of the most inadvertently tense games I’ve played in years. It’s not always fun, but Feist is an admirable feat.